U.S. EPA Administrator Scott Pruitt questioned yesterday if rising global temperatures are harmful to humans, a claim that adds new insight to his alternative views on climate change. In an interview with KSNV television in Nevada, Pruitt suggested that global warming could be seen as a good thing for people. He said civilizations tend to flourish when it's warm. "I think there's assumptions made that because the climate is warming, that that necessarily is a bad thing," Pruitt said. Recently, Pruitt has questioned whether scientists know what the ideal surface temperature should be in the year 2100, or even in 2018. Scientists have disputed that premise, saying that any swift change to global temperatures can have disruptive impacts on plants, animals and humans. Pruitt's claims yesterday adds new texture to what's known publicly about his skepticism about mainstream climate science. In the past, Pruitt steered away from commenting on what a warming world could mean for humankind. Instead, he often questioned whether humans are having a substantial impact on the climate, while acknowledging that temperatures are climbing. He has also described the science as being politicized and touted the fossil fuel industry's progress in limiting carbon emissions through innovation. Pruitt's comments yesterday moved beyond those views. "Is it an existential threat, is it something that is unsustainable, or what kind of effect or harm is this going to have?" he said. "We know that humans have most flourished during times of, what, warming trends?" A growing body of research has found that humans are warming the Earth at an unprecedented pace, chiefly through the burning of fossil fuels. Possible impacts include a few feet of sea-level rise and an increase in deadly heat waves, potentially making some areas of the planet uninhabitable. The National Climate Assessment released by the Trump administration last year found that it's "extremely likely" that humans are the primary drivers of climate change. Pruitt is right that temperatures have varied throughout geologic history. But scientists say the speed of change sets the modern age apart. It's happening over a period of decades, not millenia. That makes comparisons to the past inaccurate, they say. At the beginning of his tenure, Pruitt was criticized for saying humans are not the primary cause of climate change. Since then, he has promoted the idea of a red-team, blue-team climate debate that would highlight areas of uncertainty in the field. Pruitt's shift in rhetoric has been noticed by even his supporters. Myron Ebell, who headed Trump's EPA transition team and is director of the Center for Energy and Environment at the Competitive Enterprise Institute, said he noticed that Pruitt was parroting arguments long made by skeptics. One of them is the claim about there being no ideal temperature. Ebell said that's an "aesthetic" preference that depends on whether or not someone prefers cold weather. "When you're learning about a subject, you pick up pieces, and you don't pick up other pieces right away," Ebell said. "His rhetoric has shifted, and I expect that that is because he has been briefed by someone." EPA spokesman Jahan Wilcox declined to comment about Pruitt's briefings or if he's been talking with someone about climate science. He pointed to Pruitt's public schedule, which shows recent meetings with a number of conservative think tanks and politicians who question mainstream climate science. That includes Rep. Lamar Smith (R-Texas), chairman of the House Science, Space and Technology Committee, as well as representatives from the Heritage Foundation, Cato Institute and Manhattan Institute. Some of Pruitt's boosters publicly worried that his new talking points suggest a softening of his climate beliefs. Jay Lehr, the science director at the Heartland Institute, noted in an email that Pruitt's statements send unclear signals about his position. "Pruitt is certainly confusing us on this issue," said Lehr. "He could be preparing to push the red team-blue team approach, or he could be trying to soften opposition by not being in any way strident in his opposition to climate alarmism." 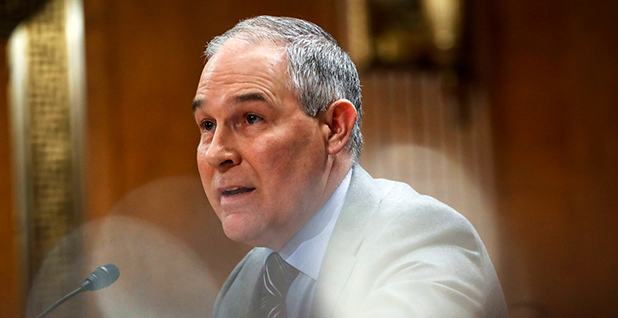 Lehr described Pruitt as having a tough job and said Heartland is satisfied, "by and large," by the work Pruitt has been doing, "but we are always on edge about any reversal of position." Pruitt's comments inch closer to those of controversial figures like the former nominee to lead the White House Council on Environmental Quality, Kathleen Hartnett White, who has pointed to carbon dioxide as the "gas that makes life possible on Earth." She had said that while human activity likely has some influence on climate, CO2 does not have the characteristics of an air pollutant that "contaminates and fouls and has a direct impact on human health." Harnett White hit opposition in the Senate, and her name was withdrawn from consideration for the position over the weekend. Others who are skeptical of climate science, such as Will Happer, who is rumored to be a contender for science adviser to the president, have pointed to the potential benefits of climate change for crops. Smith, the science committee chairman, wrote an opinion piece for the Heritage Foundation in which he claimed that rising atmospheric carbon dioxide would benefit plant life. Previously, Pruitt highlighted the uncertainty inherent in climate change. During his confirmation hearing last year, Pruitt told senators on the Environment and Public Works Committee that humans affect the climate in "some manner" (Climatewire, Jan. 19, 2017). "The ability to measure with precision the degree and extent of that impact and what to do about it are subject to continuing debate and dialogue, and well it should be," he said. Later in his tenure, as the Trump administration committed to withdrawing from the Paris Agreement, Pruitt began to note U.S. accomplishments in limiting carbon emissions, even while continuing to raise doubts about the environmental impact of doing so. Following the release of the draft national climate assessment last August, Pruitt criticized the Obama administration for politicizing carbon emissions (Greenwire, Aug. 11, 2017). "The past administration used the CO2 issue as a wedge issue," he said. "And that's why we talk about it so much. Why aren't we celebrating what we've achieved with respect to CO2?"